From the middle of the 17th century, the area around Stoke-on-Trent in central west England has been the centre of British pottery production. North Staffordshire had an abundance of coal, which was required to fire the famous bottle-kilns, and local clay was readily available. Utilitarian earthenware and slipware were the stock in trade. More decorative items began to appear around the turn of the 18th century with the work of the Toft brothers, Whieldon, and Astbury. These potters were creating ornate knife-handles for Sheffield cutlers and snuff boxes for Birmingham manufacturers, as well as delightful figurines of animals and humans. 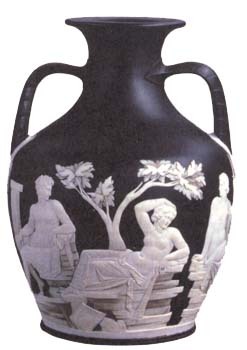 It was Josiah Wedgwood (1730 – 95) who revolutionized the “Potteries” with a refined creamware known as “Queen’s Ware”. He went on to invent black basalt stoneware and, of course, his famous blue jasperware with white-moulded reliefs. About 1770, the Wood family of Burslem perfected new glazing techniques that added vibrant colours to figurines. John Wood became well-known for his Toby Jug designs. During Victorian times, Minton introduced its highly decorative majolica wares. Some of these early designs have been recreated for the modern market. The Lambeth firm of Doulton – which had originally produced clay tiles for sewage systems – began to release art pottery pieces in the late 1800’s. William Moorcroft, inspired by the designs of Louis Comfort Tiffany, created his own unique style of raised edges around his patterns at the turn of the 20th century. 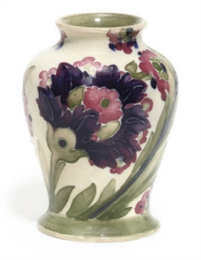 Moorcroft continues as one the most successful potteries in the world, further developing its founder’s style. All of these potters worked with earthenware, but other English potters were perfecting their porcelain techniques. From about 1745, the Chelsea factory was producing ornamental porcelain items, as was Derby. In 1876, the two firms combined to become Royal Crown Derby. Worcester was started by a Dr. Wall in 1751. It specialized in porcelain and continues to this day as Royal Worcester. Other notable British porcelain-makers were Spode, Longton Hall, Coalport, and Davenport. The fine tradition of British pottery continued with masters such as Clarice Cliff, Doris Lindner, and Susie Cooper. It carries on with contemporaries such as Rachel Bishop at Moorcroft, Nick Munro of Wedgwood, Lorna Bailey, and Brian Wood.